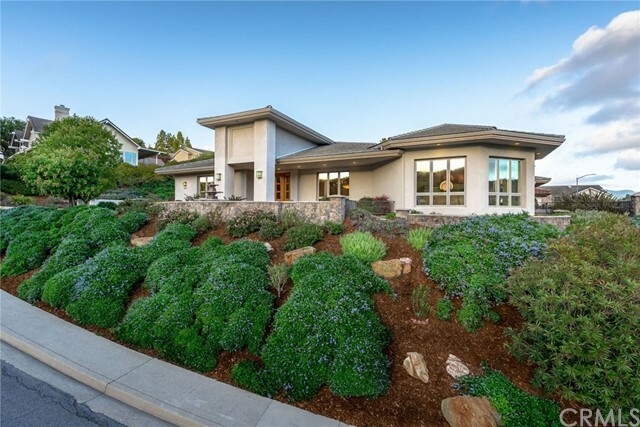 Stunning contemporary single-level home on a promontory corner lot with close-up views of bishopâ€™s peak and san luis mountain. Located in the coveted ferrini ranch estates neighborhood, the home offers 4,774 square feet of living space that includes four bedrooms, four full and one half bathrooms in an open and bright floor plan with sweeping views of the picturesque surrounding hillsides. The gourmet kitchen features acid-washed and honed granite countertops, stainless steel subzero and ge appliances, a large center island with bar seating, walk-in pantry with custom shelving, and furniture-grade cherry wood cabinetry. The home features a recirculating hot water system, three zone furnace and air conditioning systems, 220-volt service for spa, patio heaters, kitchen and laundry. There is a 28 panel photo voltaic electricity system with paid-up lease until october 2031. The backyard patio presents an in-ground spa, built-in barbecue, wood-burning fireplace, two overhead electric heaters, and an alumawood trellis, making it an ideal space to entertain and take in the gorgeous surrounding scenery. Located just minutes from downtown san luis obispo, nearby restaurants, hiking, and renowned wineries; this home puts the best of the central coast right outside your front door! For more information or make an appointment to see property ID PI19068503.